As traditional ways of reaching our audiences become less effective, higher ed professionals need to give audiences compelling reasons to engage. The rise of content-driven sites has proven the old adage “content is king” to be true. Compelling content can drive alumni donations, prospective student interest, and community volunteer support. However, there’s a lot more to a content-driven website than flashy design elements (parallax, anyone?). Higher education websites are big, complicated machines. If student workers have ever been allowed to create pages, they’re also bloated with redundant content. Naturally, the redesign priorities would need to be determined by the dean’s office (and, by extension, the board of trustees). For the sake of this article, let’s treat all information as if we’re focusing on one of these segments at a time. Before planning what your website will look like, what design elements you want to use, or anything else related to the visual appearance of your site, you need to make sure you have clear, measurable objectives. What’s the goal of your content redesign? More awareness of your brand? More alumni donations? What, in quantifiable terms, would that look like? And others. Each needs to be measurable. If you can’t express the goal in a number, you need to refine the goal. You’ll probably have a number of goals you want to achieve. In my experience, paring the goals down to 3 or 4 helps ensure a lean, efficient redesign. Understanding the content “path” of your audience helps to see what’s working, what could be improved, and what needs to be trashed. If you’ve already set up goals in your analytics suite of choice, this is a lot easier. But if not, you can determine which pages drive donations (registration pages, etc.) and then analyze what pages users view before accessing those pages. What content do people actually use? Now, how can that content take the reader on a journey to the desired destination? What does that path look like? Here’s what we did when planning the content needs for our new admissions microsite. 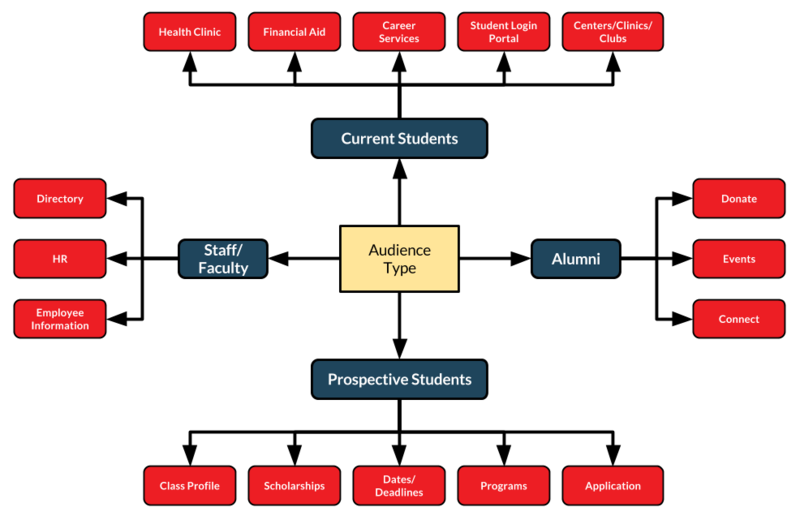 We first split our audience into two main segments: prospective students and current students. The goal was t direct current students away from the admissions pages as quickly as possible so they wouldn’t accidentally waste time looking for information in the wrong place. The apply page also allowed us to measure how many prospective students visited the apply page without actually clicking apply. Once we had the apply page clicked, we worked backwards. Every page in the admission microsite had a bold, highly visible “Apply now” link that took them to the apply page. This helped make the user path clear. We also made sure links in the admissions site only went to other pages within the microsite. By keeping prospectives in the microsite, we kept them on the content path we wanted. To borrow their example for your site, every single audience segment should clearly signal that the user is in the right place. 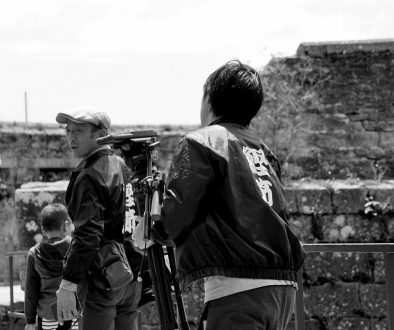 With my background in content strategy, my focus is naturally on text, video, and audio. Graphic designers need to work with User Experience specialists and Content Strategists to create an attractive, content-first design. Can’t give much help here other than to suggest all team members – content strategists, user experience specialists, web developers, and graphic designers – familiarize themselves with what’s going on around the higher ed web. Rolling out your new content-driven website is a task in and of itself. This is a pet peeve of mine. If you’re going to remove a page from your website, it 100% needs a redirect. Don’t assume no one will ever link to it. It’s easy – SIMPLE! – to protect your site from bad links you may not have thought anyone would ever want to access again. There are also SEO reasons to make sure your links work. While your SEO strategy should include backlinks analysis, there might be sites linking to your site you don’t know about. Search engines, wikis, and other important traffic sources need your links to keep working. 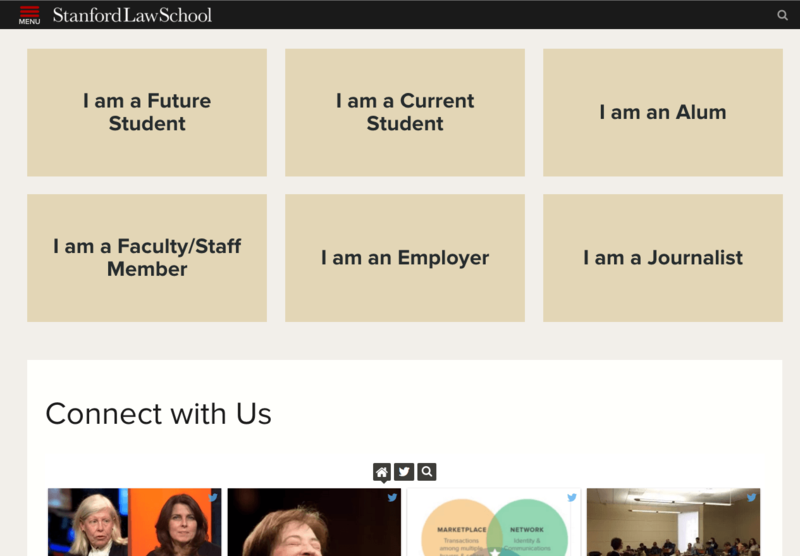 One of the biggest benefits of a content-driven redesign is that it enables the faculty news, scholarship, thought leadership and other content to reach all audiences. The website experience becomes more transparent for the user, and they’re able to engage with the content without the distraction of a clunky interface. However, without faculty-created content, it’s difficult to get a thought leadership program going. Senior deans often don’t have the time or ability to contribute directly to these thought leadership initiatives. In many cases, faculty who are naturally inclined towards creating this kind of content are already blogging on their own (and thus might not be willing to participate in a school-driven content initiative). As a freelance web content writer, I’ve had plenty of experience interviewing subject matter experts. This has been invaluable in creating thought leadership content for our higher ed site. Faculty are trained to write for peer-reviewed publications, not the web. This means either heavily editing faculty-submitted thought leadership or – my preference – using faculty as interview subjects for content written by the digital media team. Hypothetically, if your higher education digital marketing team doesn’t have a top writer on board (or doesn’t have the budget for a dedicated web writer), using a freelance writer should be fine. In addition to rolling thought leadership into your main web content, you might consider creating a microsite dedicated to publishing thought leadership. Need an example? Check out Algorithms for Innovation, a site sponsored by the University of Utah Health Sciences. They’ve got an engaging, interesting combination of academic thought leadership content packaged for mass consumption. The site actually lives on the Health Sciences site, but they’re using domain name forwarding to make accessing the content easier. Once you get a few pieces of faculty-created content, treating it properly encourages further faculty participation. One could write an entire book about getting faculty to support new content initiatives. Maybe I’ll write a post about it later. For now, it’s enough to say building faculty support for thought leadership and other content needs to begin during the new website design process, not after. In another article, I’ll show how I successfully used each of these tactics to create content for our site. But for now, feel free to reach out if you have any questions or want to chat in more detail about my process. I’m always happy to connect with other higher ed professionals. Beat your competition and grow your business through smart digital marketing. 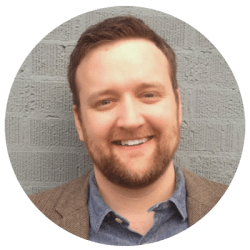 With over a decade of experience writing for the web, Matt Hall has provided strategic web content for Intel, Novell, the Huffington Post, Sundial Fitness Club, Blue Earth Nutrition, Santa Clara University School of Law, and dozens of others. He's authored millions of words of content and delivered high ROI-generating strategies that helped his clients grow by 1134% or more in just a few months.